Bunky's Charter Boats now offers 2 different types of Head Boats to fit your desire and fill your cooler. In addition to the popular Bottom-Fishing Head Boat offered for the past several fishing seasons, Bunky's has added a new "Trolling for Rock Fish" Head Boat. Please read below to help you decide which is right for you. JOIN US ABOARD OUR BOTTOM-FISHING HEAD BOAT!!! The Bottom-Fishing Head Boat is a 5 hour fishing trip open to the public. Each individual purchases their own ticket at Bunky's and joins others in a day of bottom fishing. The Bottom-Fishing Head Boat will either anchor or drift for the bottom fish in the Chesapeake Bay or Patuxent River, fishing local to Solomons. Croaker, Spot, and White Perch are most commonly caught aboard this Head Boat. Please provide something to take home your catch. Ice and bait are not included, however, they are sold in Bunky's Tackle Store. Please limit coolers and rods to one per person. You may bring your own fishing gear. Bottom rigs are recommended with size 2 or 4 hooks and 3 oz weights. Short and light fishing rods work the best. Please call 24 hours prior to departure as the Head Boat may be booked for private charters. Actual boat used varies from day to day. $45.00 per person. Sorry, price does not include rod or bait. $5.00 rod rental available. Ice & Bait are available in the tackle store. Bloodworms are highly recommended. Bait shrimp and squid are also used. Fishing licenses are not required. Bottom-Fishing Head Boat is based upon availability and not guaranteed to sail. 10 people are needed to show for the boat to sail. Please call 24 hours prior to scheduled departure as the Bottom-Fishing Head Boat may be booked for private charters. The Bottom-Fishing Head Boat will not be sailing during these months. We will run our Bottom-Fishing Head Boats Memorial Day Weekend through mid-September. Croaker will start to show up in May. As June gets here, the Spot fish will start coming around and the bottom fishing season begins. 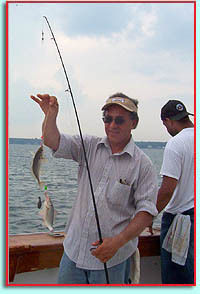 Mid-summer, the bottom-fishing season is usually plentiful. These two months are peak season. 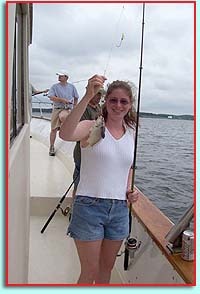 Spot, Croaker, White Perch, Blue Fish, Rock Fish, and Trout all can be caught during July and August. Jumbo Spot, White Perch and Blue Fish are being caught. Rock Fish have been caught on our Bottom-Fishing Head Boat in September as well. Towards the end of September, as the bottom-fishing comes to an end, our Bottom-Fishing Head Boat will stop running at this time. "TROLLING FOR ROCK FISH" HEAD BOAT!!! 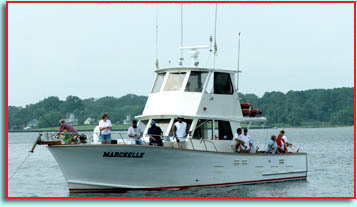 The "Trolling for Rock Fish" Head Boat is a 6 hour trolling fishing trip, open to the public. Each individual purchases their own ticket and joins others in a day of trolling with artificial lures. 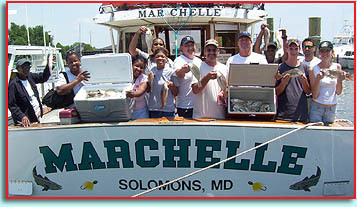 The "Trolling for Rock Fish" Head Boat will fish local to Solomons and Mid-Chesapeake Bay in search of Rock Fish and possibly Blue Fish, if they are in the area. 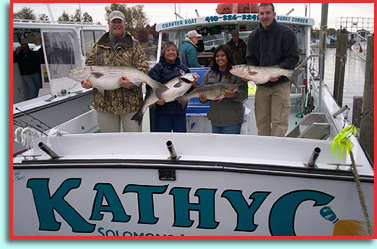 We provide all rod & reels, bait, and tackle needed for the day. Please dress for the weather, bring a lunch, and provide something to take home your catch. Please limit coolers to one per person. Don’t forget your sunglasses! Ice, drinks and disposable cameras are sold in Bunky's Tackle Store. $95.00 per person. A $25.00 per person deposit (non-refundable) is required at the time of booking. The balance is due on the day reserved prior to sailing. "Trolling for Rock Fish" Head Boat is based upon availability and not guaranteed to sail. 6 people are needed to show for the boat to sail. Please call to purchase your ticket in advance. Spring and Fall fishing seasons.